k2, p1, k2, p16, k3, p5, k3, p16, k2, p1, k2. k3, p2, k16, p3, k5, p3, k16, p2, k3. For those interested in knitting Victorian style counterpanes, there are quite a few patterns available to recreate them. The University of Pennsylvania has scanned online a pdf of Mrs. George (Anne Jane) Cupples A Knitting-Book of Counterpanes, first published in 1871. Those of us who are fans of the L. M. Montgomery ‘Anne of Green Gables‘ novels remember that character Rachel Lynde had knit 16 cotton counterpanes, a remarkable feat! If you don’t have the time or need to make a full size counterpane, you can always use the designs to make smaller items–an afghan, or baby blanket, a pillow top, or (as I’m doing) a tote bag. Some of the patterns, like the one this KAL explores, are squares; some are knit in strips or ‘stripes,’ some in hexagons, triangles, or diamonds. In the coming days I’ll rewrite a crocheted counterpane pattern, so that those who don’t knit can participate in an exploration of vintage counterpanes. One I’ve considered making for quite awhile is this design from Godey’s Magazine, 1862; I think it would make a lovely lace shawl or rectangular scarf. Day 3 of the Fleurs de Lis for Paris KAL has, once more, 10 rows. k2, p1, k1, p3, k2, p4, k7, p4, k1, p3, k1, p4, k7, p4, k2, p3, k1, p1, k2. k3, p1, k3, p2, k4, p7, k4, p1, k3, p1, k4, p7, k4, p2, k3, p1, k3. k2, p1, k1, p2, k4, p3, k7, p5, k1, p1, k1, p5, k7, p3, k4, p2, k1, p1, k2. k3, p1, k2, p4, k3, p7, k5, p1, k1, p1, k5, p7, k3, p4, k2, p1, k3. k2, p1, k1, p2, k2, p3, k2, p2, k5, p2, k1, p2, k1, p1, k1, p2, k1, p2, k5, p2, k2, p3, k2, p2, k1, p1, k2. k3, p1, k2, p2, k3, p2, k2, p5, k2, p1, k2, p1, k1, p1, k2, p1, k2, p5, k2, p2, k3, p2, k2, p1, k3. k2, p1, k1, p2, k2, p2, k3, p2, k6, p1, k1, p7, k1, p1, k6, p2, k3, p2, k3, p2, k2, p2, k1, p1, k2. k3, p1, k2, p2, k2, p3, k2, p6, k1, p1, k7, p1, k1, p6, k2, p3, k2, p2, k2, p1, k3. k2, p1, k1, p2, k9, p1, k7, p7, k7, p1, k9, p2, k1, p1, k2. k3, p1, k2, p9, k1, p7, k7, p7, k1, p9, k2, p1, k3. The instructions for the mini mystery have now been uploaded, so if you have pre-purchased please check your email or Ravelry messages for the update link. If you’d like to purchase Victoria’s Secrets, you may do so by clicking on the photo of Queen Victoria…you will be whisked away to the Ravelry pattern store! I hope that you enjoy this little design–I certainly have! Please get in touch if you need any help or find any errors. I had planned to have a Giveaway to celebrate reaching the 2000 Fan Milestone on my FaceBook page…but last night, after West Coast: Super, Natural reached 1999 “Likes”, Facebook deleted 800 fans! So unless it was a glitch that they correct, it will be some time before the 2000 Fan count is reached again. Meanwhile…all those 800 fans who had wanted to see posts about new patterns, giveaways, and works-in-progress will not see the West Coast posts. So if you are/were a fan of the Page, please check to see if you need to click on “Like” again to follow my Facebook posts. 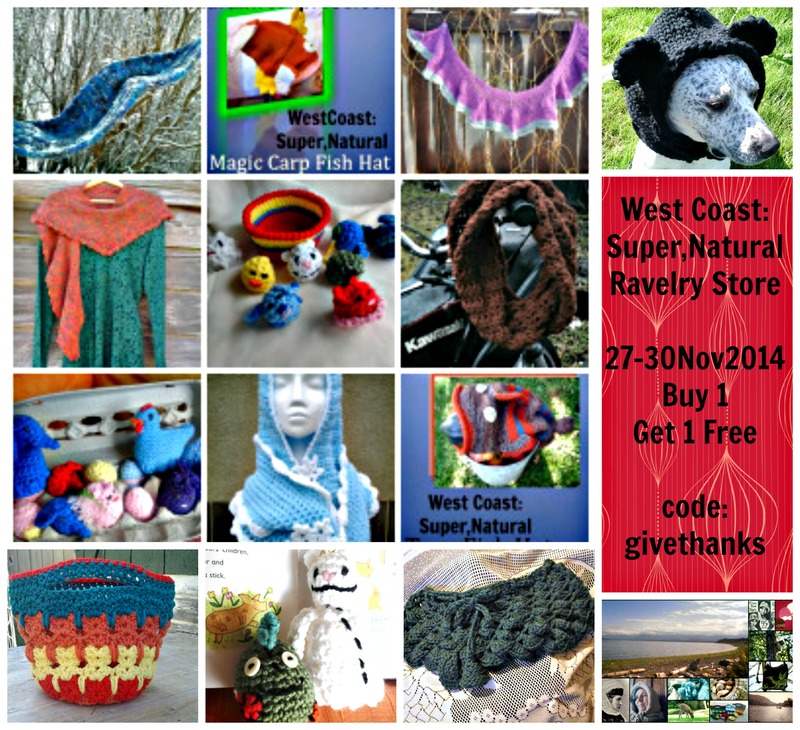 You can use the code as many times as you like, for any of my patterns, from now until midnight Pacific Time on November 30/2014. 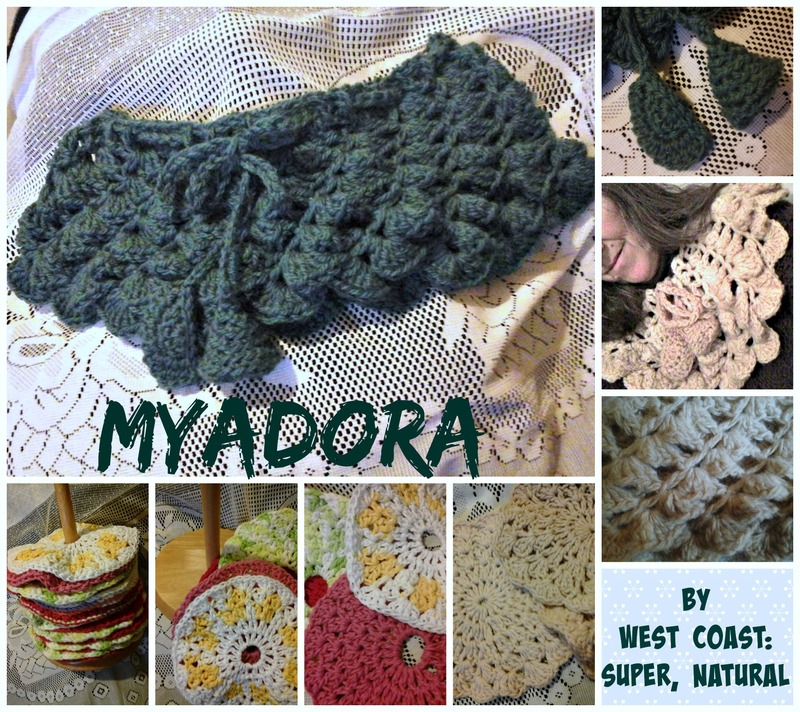 I will be adding 2 more patterns Friday–the Myadora Cowl and the Myadora Cloth. Both were inspired by a Victorian D’oyley or “Toilet Mat” design and use a lovely, simple spiraling shell stitch. In the Victorian era, a “toilet table” was what we would more likely call a “vanity” today, and the tiny “mat” made in crochet thread would have been used to put under a little bottle of scent or some other small item. The “Entwisted Cloth” free pattern, designed to thank all my followers and fans on Facebook for “1000 Likes Milestone Reached” is now available in my Ravelry Pattern Store. 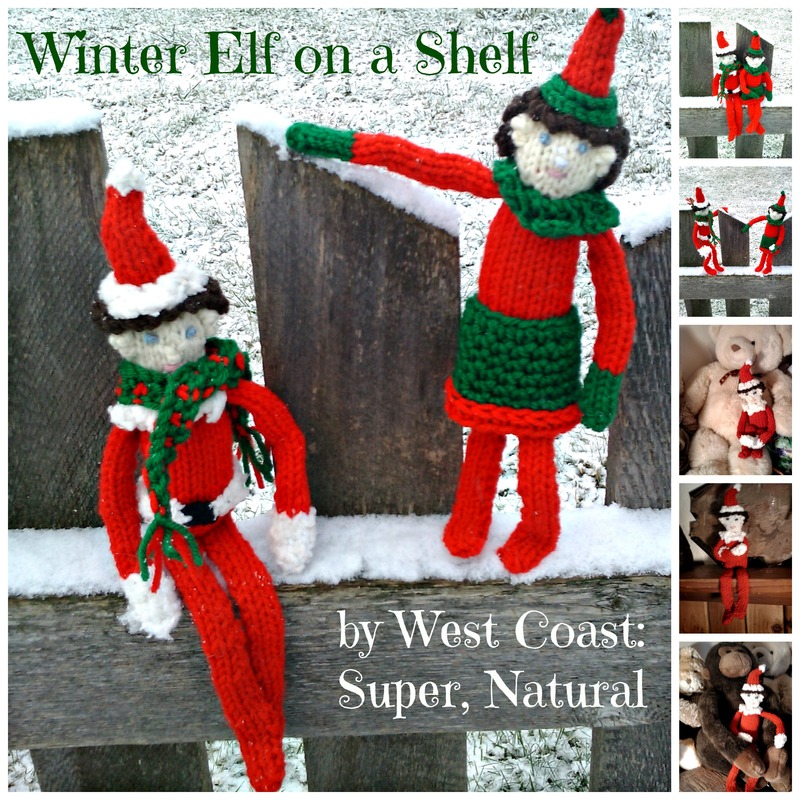 Please take a moment to add it to your Favourites in Ravelry and feel free to share the link on Facebook. This cloth is knitted with a simple but really effective knitted mesh lace that I found in a Victorian book from 1871. There are a lot of photos–so if you are a beginning knitter you can make this cloth. All you need to know is cast on, knit, slip a stitch, yarn forward, knit 2 together, and cast off. If you haven’t done a yarn over or a knit 2 together, there is a photo tutorial at the end of the pattern to show how to do them. 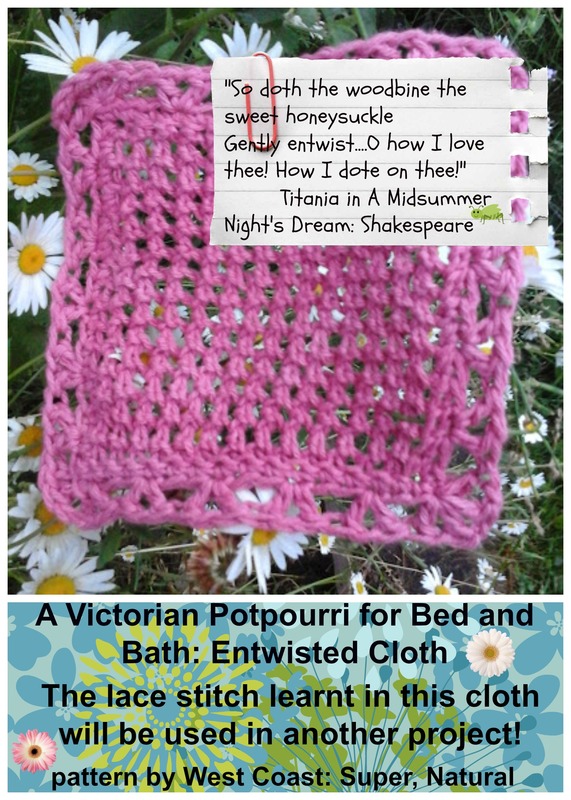 Soon there will be another design in “A Victorian Potpourri for Bed and Bath” that uses this stitch pattern, and making a cloth is a really useful way to learn new stitches. I think this cloth in the size I made only used about 25g of worsted weight Bernat Handicrafter Cotton (with 5mm needles), so you could make a set of 3 from a ball of cotton–a lovely gift for someone on your Christmas gift, if you wrap it up with a bar of locally handcrafted soap!